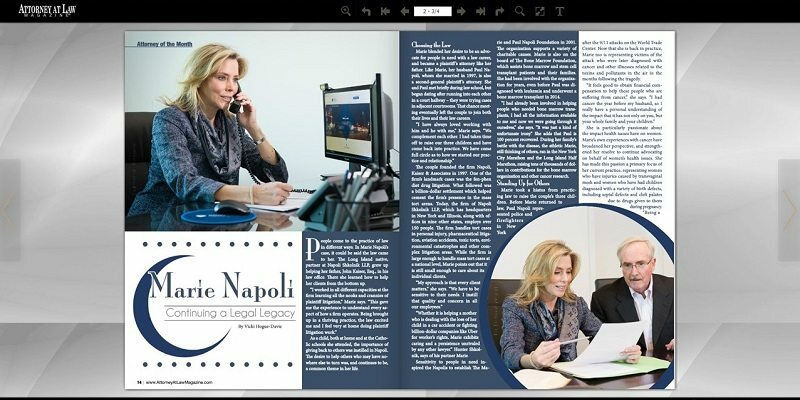 For their first anniversary edition, Attorney at Law Magazine Long Island chose Marie Napoli as their cover story! The feature highlights Marie’s beginning as a law clerk in her father’s practice, to meeting her husband Paul, to founding her own practice last year. The story also discusses Marie’s work-life balance as well her passion for philanthropy and advocacy for women’s health issues. Well done, Marie! People come to the practice of law in different ways. In Marie Napoli’s case, it could be said the law came to her. The Long Island native, partner at Napoli Shkolnik PLLC, grew up helping her father, John Kaiser, Esq., in his law office. There she learned how to help her clients from the bottom up. As a child, both at home and at the Catholic schools she attended, the importance of giving back to others was instilled in Napoli. The desire to help others who may have nowhere else to turn was, and continues to be, a common theme in her life. Marie blended her desire to be an advocate for people in need with a law career, and became a plaintiff ’s attorney like her father. 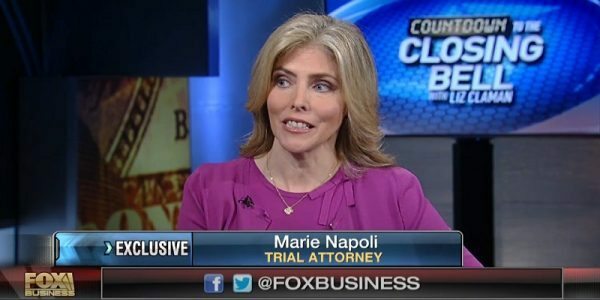 Like Marie, her husband Paul Napoli, whom she married in 1997, is also a second-general plaintiff ’s attorney. She and Paul met briefly during law school, but began dating after running into each other in a court hallway – they were trying cases in adjacent courtrooms. That chance meeting eventually left the couple to join both their lives and their law careers. 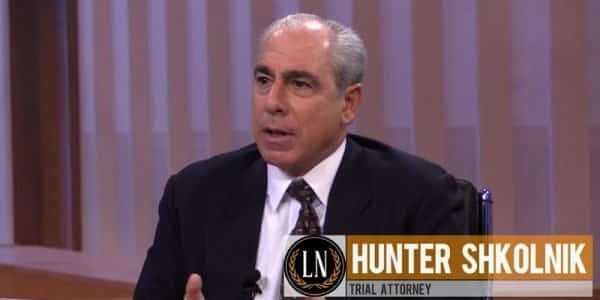 The couple founded the firm Napoli, Kaiser & Associates in 1997. One of the firm’s landmark cases was the fen-phen diet drug litigation. What followed was a billion-dollar settlement which helped cement the firm’s presence in the mass tort arena. 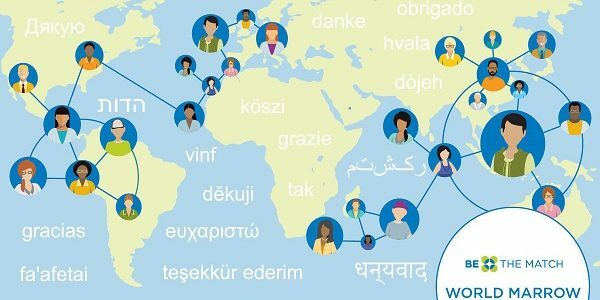 Today, the firm of Napoli Shkolnik LLP, which has headquarters in New York and Illinois, along with offices in nine other states, employs over 150 people. The firm handles tort cases in personal injury, pharmaceutical litigation, aviation accidents, toxic torts, environmental catastrophes and other complex litigation areas. While the firm is large enough to handle mass tort cases at a national level, Marie points out that it is still small enough to care about its individual clients. “Whether it is helping a mother who is dealing with the loss of her child in a car accident or fighting billion-dollar companies like Uber for worker’s rights, Marie exhibits caring and a persistence unrivaled by any other lawyer.” Hunter Shkolnik, says of his partner Marie. Sensitivity to people in need inspired the Napolis to establish The Marie and Paul Napoli Foundation in 2001. The organization supports a variety of charitable causes. Marie is also on the board of The Bone Marrow Foundation, which assists bone marrow and stem cell transplant patients and their families. She had been involved with the organization for years, even before Paul was diagnosed with leukemia and underwent a bone marrow transplant in 2014. “I had already been involved in helping people who needed bone marrow transplants, I had all the information available to me and now we were going through it ourselves,” she says. “It was just a kind of unfortunate irony.” She adds that Paul is 100 percent recovered. During her family’s battle with the disease, the athletic Marie, still thinking of others, ran in the New York City Marathon and the Long Island Half Marathon, raising tens of thousands of dollars in contributions for the bone marrow organization and other cancer research. Marie took a hiatus from practicing law to raise the couple’s three children. Before Marie returned to law, Paul Napoli represented police and f irefighters in New York after the 9/11 attacks on the World Trade Center. Now that she is back in practice, Marie too is representing victims of the attack who were later diagnosed with cancer and other illnesses related to the toxins and pollutants in the air in the months following the tragedy. She is particularly passionate about the impact health issues have on women. Marie’s own experiences with cancer have broadened her perspective, and strengthened her resolve to continue advocating on behalf of women’s health issues. She has made this passion a primary focus of her current practice, representing women who have injuries caused by transvaginal mesh and women who have had children diagnosed with a variety of birth defects, including septal defects and cleft palates due to drugs given to them during pregnancy. “Being a woman gives me an advantage when working with women with sensitive health issues,” Marie says. Away from the office, Marie brings her expertise as a plaintiff ’s lawyer to St. John’s University, where both she and Paul earned their Juris Doctor. Marie’s father also received his law degree from the school. She is on the advisory board to the dean of the law school and is also on the university’s board of governors. Additionally, the Napolis showed their appreciation and support to their alma mater by donating the funds for a lecture hall to the school in 2004. The Paul and Marie Kaiser Napoli Lecture Hall features WiFi, charging stations and a SMART podium and seats more than 160 people. While advocating for people in her professional and philanthropic life is top priority for Marie, most important to her is her own family. Marie comes from a family of eight siblings and, in addition to the support of her parents in establishing her career as an attorney, she points to the way many of her siblings have supported the couple in the firm from the beginning. A few even work for the firm. Her brother, attorney Gerald Kaiser, worked with the couple in the firm’s early days, retired and then recently returned to the firm. Connie Adams, Marie’s sister and another brother, Fred Kaiser, also work for the firm in the IT department. The couple have three children, Amanda, 15, Michael, 14, and Kaitlyn, 4. Away from the office, it is all about spending time with the family. And she says she won’t be at all surprised if, with grandfathers who were attorneys and parents who are attorneys, the younger generation enters the practice too. View the article, titled “Marie Napoli – Continuing a Legal Legacy”, here.